He started to have blurring of vision 2 years ago in his left eye. He had almost gone blind since he had no access to eye health care, that we take for granted. He worked as a farmer by the day and a watchman by the night at one of the farmhouse but he was laid off due to his poor vision. He found it difficult to sustain his family and to worsen things he became dependant on them for each and everything due to his blindness. One day, his nephew visited him and suggested he accompany him to Navi Mumbai wherein he would get him to one of the best eye hospitals in Maharashtra. Mr. Akshay Korke was reluctant as he suggested that there is no cure for a blind man and had lost all hope. But when his right eye also started developing similar blurring he told his nephew that he was willing to come to Navi Mumbai. He had taken an appointment at Advanced Eye Hospital and Institute (AEHI), one of the best eye clinics for cataract in Navi Mumbai located at Palm Beach Road; Sanpada. Mr. Korke had an appointment with Dr. Vandana Jain, cataract and cornea specialist. Mr. Korke was accompanied with his wife and nephew. His nephew described to him how AEHI had the best cataract surgeon in Vashi. Mr. Korke was then examined by Dr. Vandana jain. Little did he know what life had in store for him. Dr. Vandana Jain diagnosed him of cataract in the right eye that was still in developing stages while unfortunately his vision in the left eye was as good as that of a blind person due to the mature cataract. Mr. Korke's family anxiously waited for him in the waiting area. After the surgery, he was made to wait for an hour and was asked to come the following day to get rid of the bandage on the eye. As the bandage was removed the next day, Mr. Korke rejoiced and said, "I can see now" with a smile that reached his eye, one his family had never seen before. The whole family was happy on the cataract surgery being such a huge success. Having the left eye cataract surgery instilled more confidence in Mr. Korke to go ahead with right eye cataract surgery. After a span of 10 days the right eye cataract surgery was also carried out. It too was a success. Mr. Korke was very pleased and all he kept saying was, "Now I can tend to my farm and my master" and couldn't wait to get back home. But before he left he did send out a message that touched all of us - Nothing should be taken for granted. Dr. Vandana Jain is a renowned Cornea, Lasik and Cataract surgeon and the Director of AEHI. Dr. Jain has won best fellow awards and medals at Delhi University and L. V. Prasad Eye Institute and then further trained at Harvard, USA. Having performed more than 10,000 cataract operations, she has vast experience of dealing with all kinds of complicated cataract surgeries. 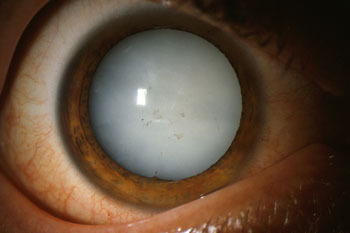 According to her, cataract surgery needs to be customized to the patient’s needs and physical disability. She additionally believes that team work and alliance with other specialists help in planning and giving the best cataract surgery results to the patients. Advanced Eye Hospital and Institute in Navi Mumbai is equipped with one of the best eye hospitals in Mumbai for comprehensive eye check-up and the operation theatres are state-of-art and equipped with the best diagnostic and surgery machines. Personalized care, infection-free modular operation theatres and beautiful ambiance complement the cutting edge eye care offered at AEHI. Besides treating patients from Kharghar, Nerul, Vashi and Panvel, patients from all over western India travel to AEHI for world class eye care management.